Questions and answers about my favourite topic. Play along at home, and drop me a comment if you want to add your own answers. Where, of all the places you have never been, do you want to go to most? Southeast Asia – Camobodia, Laos, Thailand, Vietnam. Intrepid Travel has a 4 week tour I really want to do some time in the next year or so. I have only ever been to Indonesia, and I want to see more of Asia. This part of the world intrigues and invites. Where do you most want to go back to? Greece. The Islands. Life slows down. Details are everything. I can breathe there. It is where I fell in love. This is excruciatingly difficult to choose just one, so I will cheat a bit. Favourite in Europe: Florence. Favourite in Australia: Sydney. Favourite in North America: Vancouver. I will add to this list as I live it. If you don’t use it, you’ll lose it. Too true. At times, in the past, I have had enough of the following to get what I wanted from the locals (take that how you like): French, Italian, Spanish and German. I can brush up pretty quickly, but despite studying French at university I know I will never be fluent (all those bloody verbs! ), and I care very little. How do you get by without being fluent? Smiling, sign language, and some key phrases. Smiling is the most effective. Once you’re through security, London Heathrow is like an up market shopping mall. Very posh! You will probably be shuttled from pillar to post, because they’ll change your gate 65 times, but the waiting is as pleasant as it can be in an airport. 10 years ago it was Johannesburg (smoking inside, hot, stuffy, nowhere to eat and a little scary). Most recently it would have to be LAX (see my post on my last trips through there). Before you fly, order a special meal. It will come about 30 minutes before everyone else’s. Take ear plugs and a sleep mask. Block everyone out. Wearing jeans for a long haul flight. Forgetting to ask for an aisle seat. Best coffee outside of Australia? Vancouver: Cafe d’Artigiano. BOWLS of steamy, creamy, strong, but smooth coffee. People line up outside in the snow! Indulge me. There are three. One: On Naxos, in a tiny village clinging to the side of steep hill, we arrived soaking wet, and were clothed and fed by Martina. She served us roasted goat, stuffed peppers, Greek salads topped with her homemade goat’s cheese, and rustic bread fresh from her oven. There was no menu, and it cost us about 10 Euros each. Ridiculously cheap. Two: Flying Fish in Seattle. Three courses. Sublime food. Wonderful company. I cannot wait to go back. Three: Somewhere in the heart of the Beaujolais wine region, is a tiny restaurant, whose sign is barely discernible from the road. 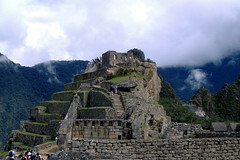 There are four tables, one of which is on a balcony which overlooks a deep and wide valley. I sat on this balcony with colleagues from my touring days for several hours, and we ate four courses of the most exquisitely presented and tasting food. My dessert was a heart-shaped strawberry mousse sitting on a chocolate shortbread crust. We drank more than a bottle each of the local wine, and did not need any dinner. Again, it is difficult to narrow this down, but two stand out. 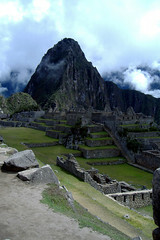 Machu Picchu in Peru, is incredible. It is literally perched on the top of pointy peaks, and sits amongst clouds. 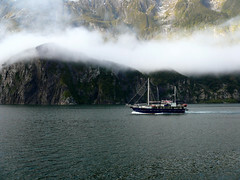 Milford Sound, New Zealand. 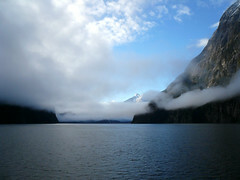 Ben and I did an overnight cruise, so we slept on the sound and then awoke to these stunning views.